It uses the state-of-the-art astronomical algorithms to calculate the position of the Moon. Most professional astrological programs use the same algorithms. When a person who had a doubt whether the Moon Sign Calculator's result was precise enough gave me her birth details, I calculated her chart using Solar Fire and then compared the position of the Moon in that chart with the result of my calculator. The results were exactly the same. It is very easy to use. You just need to enter the date and the time of birth, as well as specify the time zone where you were born. The calculator will make all the necessary adjustments and corrections and give you the position of the Moon at your birth with the minute-of-the-arc precision. It offers a focused, compact interpretation of the found out Moon Sign, concentrating primarily on those attributes that are strongly associated with the Moon. If you prefer a more detailed description, with examples, I'd recommend you my Moon Sign Book. The calculator also has some issues associated with it. The main of them is the inability of some users to figure out how to use the calculator, even though it is so simple. The date entry problem. There are two different date formats used in the world. One of them is common in the USA; it can be briefly described as mm/dd/yy, which means the month goes first, then the day of the month, then the year. The 26th of May 1990 in this format will become 5/26/90. The other format is used in the rest of the world; it can be described as dd/mm/yy, which means the day of the month goes first, then the month, then the year. The 26th of May 1990 in this format will become 26/05/90. If you use this widget, — select patiently the month, the year and the day — the resulting date will be entered in the correct format, no matter where you are from, in the world. However, many people do not bother using the widget, they just type in the date of birth in the format they are used to. And that can create a problem. Initially, the default format of the calculator was European, dd/mm/yy. That's because I live in the UK. However, most of the website's visitors are from the USA, and I kept getting emails saying that the calculator does its work for some totally different date, not the one that was entered. What was happening in reality looked like this: a user entered his or her birth date as 5/26/90; calculator understood that as the 5th day of the 26th month of the year 1990; it tried to be user friendly, so didn't complain and went ahead with the calculation for the 5th of May 1993 (which is equivalent to the 26th month of 1990); but that obviously, wasn't acceptable for the user. Since most of my visitors are from the USA, at some point I simply changed the default date format of the calculator, and I didn't have any complaints since then. But the possibility of an error still exists. 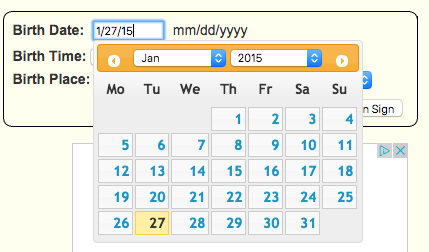 If someone will type in the date in the European format, ignoring the calendar widget (and ignoring the 'mm/dd/yy' hint clearly visible next to the Birth Date field), they will get a wrong result. The time zone versus the location problem. Another problem some users complain about is that they can't specify their precise birth location in the calculator. They could write, like, "I can select Europe/London, but there is no Liverpool where I was born". The thing is, you don't need to know the precise location to calculate the Moon Sign. All you need is the time zone of birth, and that's exactly what the calculator offers to select. But since time zones are named after major cities, some users get confused and try to find their exact town. Don't do that. Just use Europe/London for the whole of the UK, or America/New York for the whole of the Eastern Time area. Admittedly, I could simplify this time zone selector, leaving just "Eastern Time", "Mountain Time" and so on. I will think about that. The birth time uncertainty. There are relatively frequent questions about whether it is possible to find out your Moon Sign if you don't know the time of birth. It is possible, in the greatest majority of cases, and I am planning to devote one of the coming blog posts to answering this question. A rare time zone error. Let me tell you straightaway that this problem will hardly affect more than 1% of the users, possibly a lot less. To be among those whose Moon Sign will be defined wrongly because of the technical limitations of the calculator, you need to be born very close to the time when the Moon crossed the border between two signs AND to be born in one of those places on the Earth where the time zone history is not straightforward. By "not straightforward" I mean that there are areas like Florida, where currently the Eastern Time is used in the same way it is used in New York, however in the 1950s Florida didn't observe Daylight Saving Time. The calculator doesn't know such nuances. It uses the definitions of the time zones provided by the computing platform. Those definitions are good enough in most cases, but not in all cases. To make the calculator more precise, I would need to use a special database containing all the known historical changes to the time zones around the world. Such a database does exist, but its licensing terms are prohibitive. However, the same database is used in many astrological software packages, and if you really need to know your Moon Sign with the highest precision and reliability, wait for one of my coming posts where I'll explain how to use some of the free packages available online. It should come as no surprise that if the government in some country (like Russia) keeps changing time zones and rules for daylight saving times, the most recent changes will not be reflected in the online time zone definitions, so again, my Moon Sign Calculator can be an hour off in those cases.